On Monday 8 February, the U.S. Department of Agriculture (USDA) awarded $20.1 million in grants to university researchers for research and extension projects to help citrus producers fight Huanglongbing (HLB), commonly known as citrus greening disease. This funding is available through the Specialty Crop Research Initiative (SCRI) Citrus Disease Research and Extension Program (CDRE), which was authorized by the 2014 Farm Bill and is administered by USDA’s National Institute of Food and Agriculture (NIFA). All of the projects funded this year meet the priorities recommended by the Citrus Disease Subcommittee, which is mandated by the Farm Bill to provide an annual consultation with NIFA to recommend priorities, an agenda, and annual budget for the CDRE. The Citrus Disease Subcommittee is part of the National Agricultural Research, Extension, Education, and Economics Advisory Board and will meet on February 17-18, 2016, in Riverside, Calif. to discuss and recommend the priorities for the 2016 CDRE awards. For more information, please visit http://www.usda.gov/farmbill and http://www.nifa.usda.gov/impacts. The USAID Feed the Future Innovation Lab for Integrated Pest Management at Virginia Tech invites the submission of concept notes from U.S. universities, CGIAR institutions, other International Agricultural Research Institutions, and host country institutions to compete to lead the Innovative scientific research and technology transfer to develop and implement integrated pest management strategies for rice pests in Cambodia. Concept notes will be reviewed and may lead to an invitation to submit a full proposal. U.S. universities as defined under Section 296(d) of Title XII of the Foreign Assistance Act, CGIAR, AIRCA, and host country institutions are eligible to apply as the lead institution for a period of 4.25 years. Total funding (single award) is $2.0 million. Collaboration or partnerships with relevant and appropriate host country organizations, other universities, the IARCs, and/or development community partners is encouraged. 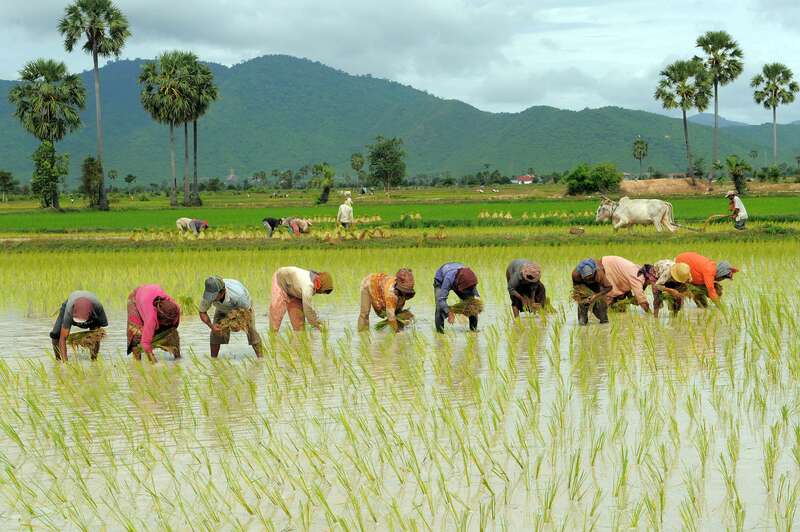 Concept notes for Innovative scientific research and technology transfer to develop and implement integrated pest management strategies for rice pests in Cambodia are due May 28, 2015. The Virginia Tech IPM Innovation Lab is funded by the U.S. Agency for International Development under cooperative agreement AID-OOA-L-15-00001. Copyright © 2014 Feed the Future Innovation Lab for Collaborative Research on Integrated Pest Management, All rights reserved. The USAID Feed the Future Innovation Lab for Integrated Pest Management at Virginia Tech invites the submission of concept notes from U.S. universities, CGIAR institutions, and host country institutions to compete to lead the Vegetable Crops and Mango IPM in Asia. Concept notes will be reviewed and may lead to an invitation to submit a full proposal. U.S. universities as defined under Section 296(d) of Title XII of the Foreign Assistance Act, CGIAR, and host country institutions are eligible to apply as the lead institution for a period of 4.25 years. Total funding (single award) is $2.75 million. Collaboration or partnerships with relevant and appropriate host country organizations, other universities, the CGIAR system, and/or development community partners is required. Concept notes for Vegetable Crops and Mango IPM in Asia are due May 15, 2015. The USAID Feed the Future Innovation Lab for Integrated Pest Management at Virginia Tech invites the submission of concept notes from U.S. universities, CGIAR institutions, and host country institutions to compete to lead the IPM for Exportable Fruit Crops in Vietnam. Concept notes will be reviewed and may lead to an invitation to submit a full proposal. U.S. universities as defined under Section 296(d) of Title XII of the Foreign Assistance Act, CGIAR, and host country institutions are eligible to apply as the lead institution for a period of 4.5 years. Total funding (single award) is $0.8 million. Collaboration or partnerships with relevant and appropriate host country organizations, other universities, the CGIAR system, and/or development community partners is required. The USAID Feed the Future Innovation Lab for Integrated Pest Management at Virginia Tech invites the submission of concept notes from U.S. universities, CGIAR institutions, and host country institutions to compete to lead the Biological control of the invasive weed Parthenium hysterophorus in East Africa. Concept notes will be reviewed and may lead to an invitation to submit a full proposal. U.S. universities as defined under Section 296(d) of Title XII of the Foreign Assistance Act, CGIAR, and host country institutions are eligible to apply as the lead institution for a period of 4.5 years. Total funding (single award) is $0.75 million. Collaboration or partnerships with relevant and appropriate host country organizations, other universities, the CGIAR system, and/or development community partners is required. Concept notes for Biological control of the invasive weed Parthenium hysterophorus in East Africa are due January 30, 2015. Feed the Future (www.feedthe future.gov) is the U.S. Government’s global hunger and food security initiative. With a focus on smallholder farmers, particularly women, Feed the Future supports partner countries in developing their agriculture sectors to spur economic growth and trade that increase incomes and reduce hunger, poverty and undernutrition. On behalf of the International Association for the Plant Protection Sciences (IAPPS) and the local organisations responsible for organising this International Plant Protection Congress series, it is our great pleasure to invite you to the XVIII. International Plant Protection Congress (IPPC) 2015, scheduled from 24-27 August 2015 at Henry Ford Building, Berlin (Germany). We would like to hereby kindly remind you that abstract submission is possible in English and online until 1 February 2015. Please click here to submit your abstract online. We are happy to announce that several societies offer travel grants for international conferences such as the IPPC. Please visit our conference homepage www.ippc2015.de to find a small collection of funding opportunities and the corresponding application requirements. ATTENTION! Please note that the application deadline of the Browning Plant Medicine and Health Travel Award ends on 14 November, 2014 and the application deadline of the Student Educational Award (both awards offered by the American Phytopathological Society) ends on 21 November, 2014.Take advantage of this opportunity and apply now! If you have any further questions regarding the conference, please contact the organizing agency Conventus via phone 0049 3641 31 16-374 or email ippc@conventus.de. We are looking forward to receiving your contributions to this unique international and multi disciplinary congress and to welcoming you to the exciting city of Berlin! Deutsche Phytomedizinische Gesellschaft e.V. – The German Scientific Society for Plant Protection and Plant Health r.S. Millions of smallholder banana farmers in Tanzania and Uganda are set to benefit from a new $13.8 million project to develop and distribute higher-yielding, disease-resistant hybrid banana varieties. The effort is being funded by a grant from the Bill & Melinda Gates Foundation to the International Institute of Tropical Agriculture (IITA). Rony Swennen, a professor at KU Leuven and head of banana breeding at IITA, is leading the project. Bananas are both a food staple and an economic backbone in East and Central Africa, where over half of all cultivated land is planted with bananas. Uganda and Tanzania produce over 50% of all bananas grown in Africa. The region’s yearly banana crop is valued at $4.3 billion. However, banana production in Uganda and Tanzania achieves just 9% of its potential yield due to pests and diseases, posing a serious threat to the future sustainability of banana production in the region. A new five-year project aims to dramatically upscale and speed up existing banana breeding efforts in the two countries. The researchers expect their hybrid banana varieties to have a 30% higher yield and a 50% higher resistance to at least three of the target pests and diseases compared to the current varieties grown by the farmers under the same on-farm conditions. The varieties will also meet over 90% of the quality traits for consumers found in the current cultivars, say the researchers. The project builds on a very successful collaboration between IITA and Uganda’s National Agricultural Research Organization (NARO), which culminated in the development of the first 26 high-yielding, and disease-resistant hybrid varieties, called NARITA varieties. The project will also support the on-farm testing of these hybrids in Uganda and Tanzania, will improve the technical capacity of the breeding programmes in the region, will strengthen partnerships with farmers, and will develop local human capacity by supporting 8 PhD projects and 5 MSc research projects. The IITA, Bioversity International and the CGIAR Research Program on Roots, Tubers and Bananas are also providing substantial co-financing.